The saddles on a tune-o-matic style bridge are raised and lowered as a unit. The outer thumb wheels beneath the bridge control it's overall height. Each saddle has a screw which permits forward and backward movement that enables us to adjust string length, which sets intonation. The Gibson® Tune-O-Matic style bridge comes in different styles which can lead to confusion. While there are several differences an easy comparison is the mounting post. The ABR's bridge post are an all threaded rod and use a thumbwheel for height adjustment. The Nashville TOM bridge uses inserts which are installed into the body, the bridge post then screws into the inserts for height adjustment. They are threaded at the base and normally solid (un-threaded) at the top. Nashville bridges are wider from front to back, which increases the travel of the saddle. This gives us a greater range for adjusting intonation. Nickel parts tarnish over time and will begin to look dull. This is often preferred on vintage instruments. Chrome plating remains shiny and does not tarnish. When comparing two new parts (chrome vs. nickel) you may notice chrome looks more "blue", while nickel appears more "yellow". Bridges, such as those commonly seen on Fender Stratocaster's have two large screws in the front which the assembly pivots (rocks) on. These also control how far above the body the bridge sits. Individual string height and intonation is also available. 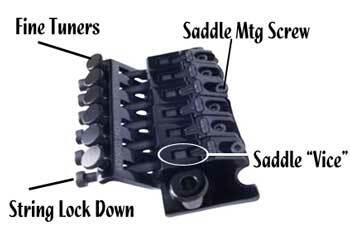 Each saddle has two small allen head screws which act as feet and control the saddle's height and therefore the string height. A single screw, towards the back controls string length and intonation. The Floyd Rose® style floating tremolo has lovers and haters. While it may the right tool for the job, it doesn't come without it's fair share of headaches. For those not using their floating tremolo, it is a simple matter to block the tremolo and essentially make it a hardtail. On the top of the bridge are 6 small thumbwheels which serve as fine tuners. 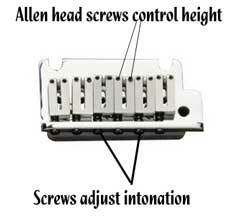 Because most instruments equipped with these tremolo's also incorporate locking nuts, tuning must be done at the bridge. To the rear are allen head screws which press against a small block inside the bridge's saddle which acts as a vice for holding the end of the string securely. When replacing a string, the screw is loosened and a new string (minus it's ball end) is inserted into the space in front of the small block. The string lock down screw can then be tightened. Loosen one of these and your saddle may go flying forward, wreaking havoc on the intonation. These screws clamp down on the saddle and keep it in place. They are loosened when intonating the instrument requires the saddle's position be moved forward or backward. Most bridges have two holes in the plate beneath the saddle to permit greater flexibility of positioning. If intonating the saddle requires it be moved considerably, changing holes may be required to allow the saddle mounting screw to contact the saddle firmly.